Every afternoon, as the sun sets, throngs of refugees gather on the ring road encircling the huge Za’atari refugee camp for Syrians in northern Jordan. They try to secure a place on one of three buses heading back to Syria daily, stuffing suitcases through windows, nearly throwing children over people’s heads onto the bus. While they scream and tussle, a heavy presence of Jordanian riot police stands guard, ready to step in with batons when things get out of hand, as they often do. Amid concern from aid agencies, the number of Syrian refugees leaving Jordan to return to their country has increased in the last two months. Since the beginning of April, the UN Refugee Agency (UNHCR) has seen a “pick-up” in the number of spontaneous returns to southern Syria, according to the organization’s representative in Jordan, Andrew Harper. “While still relatively limited, at 250-300 per day, the numbers may increase should the security situation and provision of assistance in the south of Dera’a improve,” Harper said. Refugees say many of the returnees are from areas in Syria’s southern Dera’a Governorate that have been "liberated" by the rebel Free Syrian Army (FSA) - UNHCR said in April this constituted 80 percent of returnees. But returns have continued even as government forces have retaken territory in recent weeks. According to the Jordanian government, nearly 60,000 Syrian refugees have voluntarily returned to Syria since the camp was opened last summer. Jordan is home to more than half a million Syrian refugees, according to government figures. "It is all sorts of people returning: families, children, men and women," said Anmar Alhmoud, Jordan's spokesperson for Syrian refugee affairs. One aid worker, speaking on condition of anonymity, told IRIN the demographics of returnees have changed since April from mostly single men to include families and children. On the other hand, the number of Syrians crossing to Jordan has declined. In the last week of May, 3,500 Syrians crossed the border; compared to earlier numbers of 1,500-3,000 per day. According to UNHCR, the reasons for returning are varied, including improved security in some border villages, safeguarding property or checking on farms, re-uniting with family members in Syria, or travelling to collect and bring back vulnerable family members to Jordan. The organization suspects most returnees have subsequently returned to Jordan. One refugee in Za'atari camp told IRIN she travelled back to Syria temporarily to access medicine unavailable in the camp. Another, an elderly woman in Za’atari, said she travelled to Jordan to help her son - who, as a single young man would otherwise not be allowed to cross the border - with the intention of returning to Syria one week later. Harper said many refugees “recirculate” from Jordan to Syria and back in the hope of “doubling up” on assistance – a trend confirmed by refugees in the camp. To prevent this, UNHCR is hoping to introduce a biometric identification system. The increase in returns could also be due to better logistics. The Jordanian government facilitates applications of returnees through committees consisting of refugees themselves, and has provided more buses to carry returnees to the border. “This has made it easier," Alhmoud said. But others return more permanently, having found the refugee experience harder than they anticipated: they are unable to afford rent in Jordan's cities and towns and cannot adapt to the harsh life in the desert camps. "When the revolution began, we chanted ‘Death is better than humiliation’, but when we came here [to Jordan], we realized that we left death to live in humiliation." “Life is too expensive outside Za’atari, but unbearable in the camp,” said Abu Malik,* who spent three months trying to make some money in the northern Jordanian town of Irbid. The camp is home to 120,000 people who live in tents and caravans in the middle of the desert in conditions that - while improving - remain very difficult. Riots occur almost daily over perceived injustice in distribution and general frustration over insufficient help. While each refugee receives a food voucher from the World Food Programme, and aid agencies truck 3.5 million litres of water to the camp every day, many refugees are convinced - mistakenly aid workers say - that the water is not clean. Hot weather and unhygienic conditions in some parts of the camp compound the problem. "It is a miserable place to be,” said Basel Hourrani, an activist in the camp. “Often there is no water in the toilets, which made some families build toilets near their tent. This has led to a spread of bugs and diseases in the camp." UN agencies and NGOs have appealed for billions of dollars, in part to help improve conditions at the camp, but humanitarian funding for the Syrian crisis has been consistently disproportionate to the needs. "Death is better than humiliation"
"When the revolution began, we chanted ‘Death is better than humiliation’, but when we came here [to Jordan], we realized that we left death to live in humiliation," Khaled* told IRIN as he and other young men clashed with security outside the gates of the camp. Musa Abdalllat, a lawyer who represents jihadist groups in Jordan accused of “terrorism”, estimates that thousands of Syrian men returned since the beginning of the conflict to join the FSA or US-designated “terrorist” group Jabhat al-Nusra in their fight against the forces of Syrian President Bashar al-Assad. Numbers have increased in the past three weeks, Abdallat said, but on average 30-40 men return to fight every week. Some refugees attributed the returns to better conditions in southern Syria, where the main road linking the south to the capital Damascus has been reopened. Residents and activists in Syria say people are returning mostly to the eastern part of Dera’a governorate and central Izraa village, areas controlled by the FSA. According to Marwan, a member of one of the refugee committees in Za’atari camp, food and other items are being delivered in the governorate. Aid sources say an increasing number of countries are pushing to deliver aid across the Jordanian border. The opposition is also trying to deliver basic supplies to areas of the south. Still, the return of scores of refugees is straining an already tenuous humanitarian situation. According to sources in the city, Dera’a is now split into two parts, one held by the regime forces and one controlled by rebel fighters. Activists said returnees are heading to rural areas where fighting is less intense, but clashes, shelling and bomb attacks remain frequent. In April, UNHCR spokesperson Melissa Fleming said the organization was "very concerned that refugees are returning to areas blighted by shortages of food, lack of fuel and electricity and limited services. The security situation is volatile, with reports of artillery shells and mortars being fired into villages refugees are trying to reclaim their homes and lives in." Fighting is not the only risk for returnees. Alhussen left Syria last December because his activism had attracted the ire of security forces. He is still wanted, but says he is less worried now since he is hiding in an area taken by the FSA, where the security forces cannot reach him. Even where security is better, refugees are often returning to “terribly damaged” towns and villages, Hourrani told IRIN. "They either stay in farms, schools, with friends or relatives, or in the homes of the people [who left and went] to Jordan," he said. Um Majid, whose house in Dera’a was hit by a rocket, says she is happy to seek shade underneath a tree or hide in the backyard of a school. 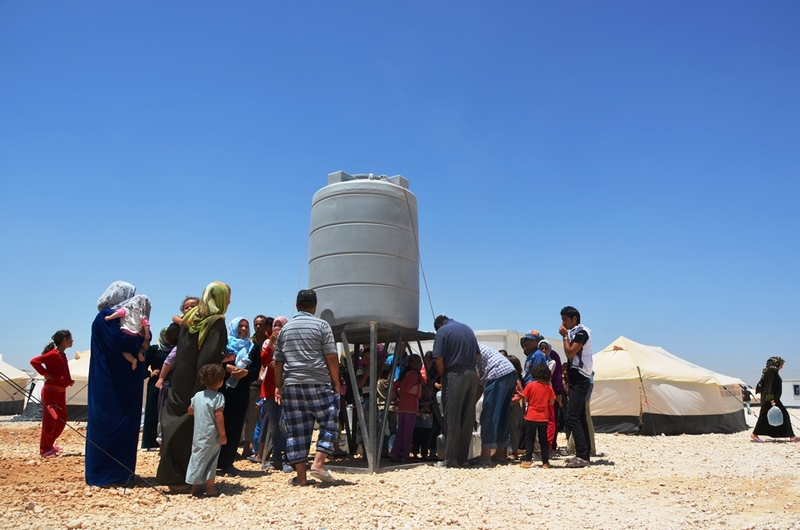 "At least there is water, and hopefully my child will be [safe from] from diarrhoea and sickness caused by the heat and dust [in the refugee camp]," she noted.